Directors – Jonathan Dayton & Valerie Faris, Screenplay – Zoe Kazan, Producers – Albert Berga & Ron Yerxa, Photography – Matthew Libatique, Music – Nick Urata, Visual Effects – Brickyard VFX, Production Design – Judy Becker. Production Company – Bona Fide Productions. Calvin Weir-Fields has been a successful novelist with his first book but is having difficulty starting on his follow-up. His love life is also a disaster zone after his girlfriend Lila leaves him. He has a dream about meeting a girl in the park. Afterwards, he wakes and begins obsessively writing a new manuscript about a girl Ruby Sparks that the protagonist, whom he names Calvin, meets. He confesses to his brother Harry that he thinks he is falling in love with the character of Ruby. He is then puzzled as items of female clothing keep turning up in his house. Next, he wakes to find Ruby there and insisting that she is his girlfriend. He thinks he is going crazy until he realises that other people can see Ruby too. As he puzzles over whether he has conjured Ruby out of his imagination, Harry suggests that Calvin attempt to write something about Ruby – that she speaks fluent French – and they are startled when it instantly comes true. Calvin and Ruby are happy together but when problems start to surface in their relationship, Calvin is unable to resist the desire to write them right – with disastrous results. 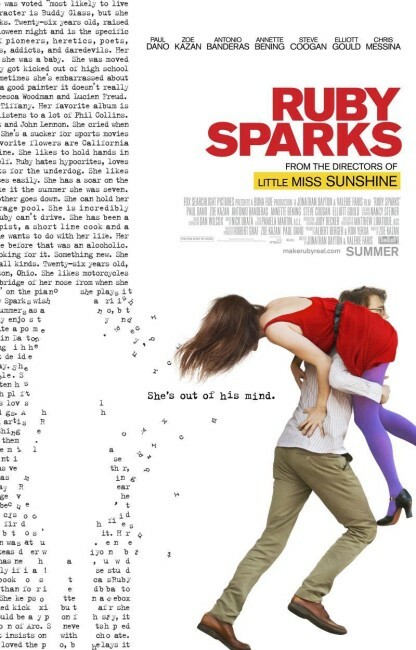 Ruby Sparks is the second film from the husband-wife team of Jonathan Dayton and Valerie Faris. The two previously made their debut feature with the enormous indie breakout hit of Little Miss Sunshine (2006). Before that both had notable careers in music video for artists such as Paula Abdul, Janet Jackson, Oasis, R.E.M. and Smashing Pumpkins – yes, they directed the clip for the Pumpkins Tonight Tonight (1996) that homaged Georges Melies’ A Trip to the Moon (1902). Subsequent to this, they went on to make the Billie Jean King film Battle of the Sexes (2017). Ruby Sparks is a venture into meta-fiction, a sub-genre of fantasy that deals with the blurring of lines between fiction and reality – featuring either characters entering into or emerging from the worlds of books or movies, or peculiar mirrorings between the two such as the author/filmmakers winding themselves or the process of writing into a text. Variations on the idea of a fictional character coming to life have been used before in other works such as Je Tu Il (1981), I, Madman (1989), Blackeyes (1989), In the Mouth of Madness (1995), The Strange Case of Sherlock Holmes and Arthur Conan Doyle (2005), Stranger Than Fiction (2006), Written By (2009) and with characters on film and tv in the likes of The Purple Rose of Cairo (1985), Delirious (1991), Last Action Hero (1993), Wes Craven’s New Nightmare (1994), Rubber (2010) and Camera Shy (2012). Ruby Sparks does nothing particularly original with its central idea that we have not seen in any of the above mentioned. What I think made the difference that prevented Ruby Sparks from being a standout film was that it never pushed the central idea beyond the merely amiable. Once past the initial set-up, three-quarters of the film plays out as a quirky indie romance without the need for its fantastical premise for the greater part. The film takes longer than it feels it should have for Paul Dano to go over to the dark side and feel that he can start ironing out the problems in their relationship by tinkering with Ruby’s character and the inevitable point where she discovers that she is a fictional creation. Here I felt the film never took the concept far enough – there is an effective scene where Paul Dano sits at the typewriter making Zoe Kazan do everything he writes – but he then just decides to let her go whereupon the film peters out and comes to an end. Here the film fails to fully transcend its quirky cuteness and get to grips with the Svengali relationship between the two and the sense of narcissism involved in a writer conjuring up his ideal woman. The sweet uplift ending the film goes out on lets Paul Dano off the hook rather lightly. That makes it ultimately little more than an indie variation on Weird Science (1985). What makes the film work is the freshness and sparkle of its characters and cast. One of the year’s greatest finds is Zoe Kazan who lights the film up with her charms. She has been bubbling around just under the radar for the last few years with roles in films such as Fracture (2007), In the Valley of Elah (2007), Me and Orson Welles (2008), Revolutionary Road (2008) and Meek’s Cutoff (2010). Kazan also writes the film’s screenplay and is no doubt going to gain a great deal of attention as a result of her dual roles here. She is like a Miranda July who is a foot shorter and less unsure of herself. Whenever Kazan is on screen, she manages to make the part twinkle. Paul Dano is fairly much stuck with a single uptight and glum hangdog expression throughout the film but does reasonably well with the part, while Paul Messina makes a good showing as his brother. Most of the show however is stolen by the veteran supporting cast with Steve Coogan, Annette Bening and Antonio Banderas having the maximum amount of fun and playing for broke in their respective roles. (Nominee for Best Actress (Zoe Kazan) and Best Supporting Actress (Annette Bening) at this site’s Best of 2012 Awards).